Automotive Glass Market size was valued at over USD 12 billion in 2017 and is predicted to exhibit around 7% CAGR between 2018 and 2024. Rising disposable income particularly in developing nations is driving the automotive production thereby increasing automotive glass industry demand. Rising concerns for passenger safety will escalate the product penetration rate. Emerging smart glass technologies to improve sunlight protection, enhance visibility, and comfort will support in revenue generation over the forecast period. Consistent innovations in product features and technologies have increased the automotive glass delivery to auto OEMs. Changing automotive design trends along with increase in glass usage in vehicles have enhanced the overall automotive glass consumption per vehicle. Increasing replacement of metals with glass supports in vehicle weight reduction, preferred by the auto makers. Legal amendments such as United Nations Economic Commission for Europe (UNECE or ECE), Federal Motor Vehicle Safety Standards (FMVSS), etc. to offer maximum fuel efficiency and safety to the passengers has influenced the manufacturers towards extensive R&D, fuelling the automotive glass industry growth. Lightweight properties to minimize carbon emissions along with better safety are stimulating product penetration. Shifting customer preference for glazing will escalate the automotive glass industry revenue over the forecast time span. OEMs are focusing to standardize glazing in the vehicle production that provides substantial features including impact resistance and scratch proof. These laminated glasses are highly durable and provide high UV resistance. Soda ash and silica sand are essential raw materials used in manufacturing glass. Natural gas is a dominant fuel used in the glass production. Easy availability of natural gas at low cost hampers the automotive glass market. Storage, weather, and economic growth also affect natural gas prices in different regions. Laminated automotive glass market size was valued at over USD 7 billion in 2017 and is expected to grow at over 7% over the projected time span. This growth can be credited to features such as minimization of the obstacle penetration by avoiding scattering of fragments. Production process including heat treatment with two layers of glass supports this property. Increasing applications in windshield and growing safety standards in vehicles is expected to drive the market size. Tempered automotive glass market volume size is estimated to account for approximately 45% by 2024. It is widely utilized for sidelite and backlite in vehicles. The production process includes heating at high temperature followed by rapid cooling. This enhances the property of breaking it into very small pieces during accidents. Rising accident numbers coupled with low cost repairs is expected to spur the segment growth. Global sidelite automotive glass market revenue share is predicted to hold more than 63% over the study time span. Sidelite, commonly referred as side window has witnessed increasing consumption owing to the better visibility property. Windscreen market is predicted to exhibit CAGR of over 7% between 2018 and 2024. Stringent regulations by various government authorities such as UNECE regulating the standard for safety concerns, is boosting the market share. The regulations include approval process and standards to ensure the passenger safety. Silica sand and soda ash are the key raw materials involved in the production of automotive glass. The proportion of the raw materials vary as per the product category and manufacturing procedures. High energy consumption, equipment, transportation, safety & precaution costs, and manufacturing process are the factors influencing the price trend. Light commercial segment will pose a CAGR of around 5% over the study period. Increasing goods transportation in rural areas is enhancing the light commercial vehicles consumption. Heavy commercial vehicle glass is available in larger size and with wider thickness. Rapid industrialization, development of road infrastructure, and stable growth in commercial activity especially in distribution logistics & public transport will drive the product demand. OEM dominates the automotive glass market holding over 80% in 2017. Rising safety concerns is expected to drive the market demand. The product is comparatively expensive as compared to its counterpart. In addition, OEMs are the suppliers of vehicle manufacturers during automobile assembly. Automotive glass makers commonly build tie ups with auto makers to enhance their revenue. Aftermarket replacement glass market is expected to witness CAGR over 6%. Rising number of accidents coupled with damage due to weather is expected to drive the automotive glass market size growth. High consumer preference for low cost products drives the ARG business demand. Regulations regarding copyright and patent infringement may act as challenge for aftermarket industry growth for aftermarket replacement glass. The product is manufactured with same size and shape of the original products to ensure proper fitting but however, tint, colour, and thickness may vary from original product. U.S. automotive glass market size will grow at approx. 4% during the forecast period. Rising demand from original equipment is the key factor in light vehicles. Stringent regulations regarding safety is expected to drive the industry demand. OE along with aftermarket industry adhering to the FMVSS regulations including safety measures, strength, and crash resistance. Asia Pacific is one of the leading contributors to the overall industry with China, India, and Japan. China is the major producer of automotive vehicles owing to economical availability of resources including labour and land. Favourable Foreign Direct Investment (FDI) policies is the supporting factor for industry growth. This has resulted in competitive advantage for increasing OEM products for various automobile manufacturers in this region. 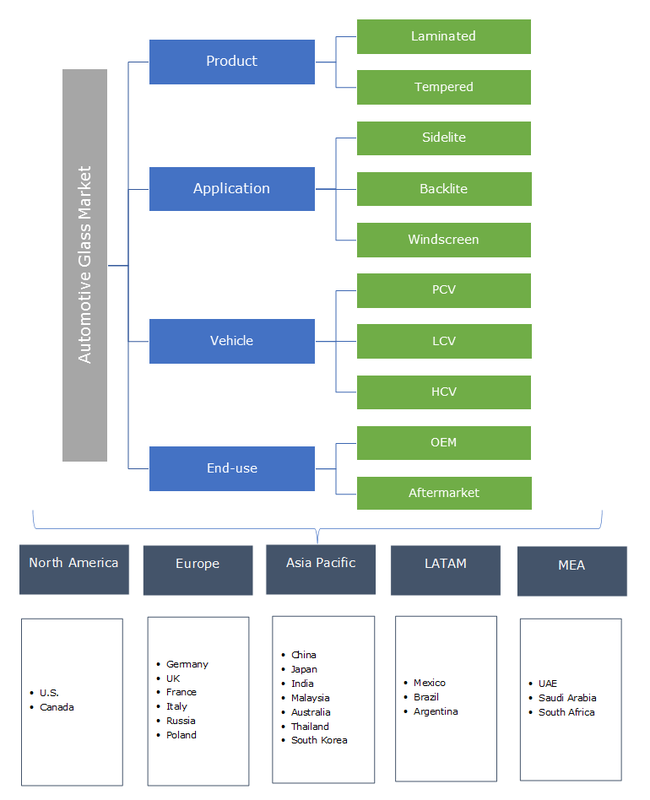 Global automotive glass market share is consolidated with the major industry players including AGC, Saint Gobain Sekurit, Fuyao, NSG, Nippon, and Guardian. Mergers and acquisitions are the major strategies adopted by these industry players. For instance, in 2016, Saint-Gobain officially acquired France Pare-Brise, having large franchise network of automotive glass repair and replacement market in the country. The acquisition has allowed the company to capture a position in the fitting industry in Europe. Other notable industry players include Webasto, Fuso Glass India Pvt. Ltd., PGW, Shenzhen Benson, PPG Industries, and Gentex Corporation. 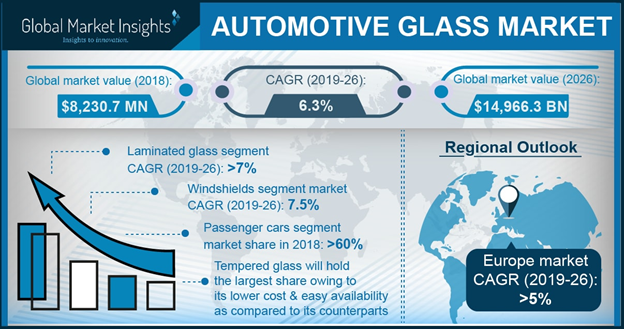 Automotive glass market size is part of flat glass industry, increasing applications from automobile is expected to drive the industry demand. The product is used in automobile industry in sidelite, backlite, and windshields. Regulations regarding use of the product in automobile is expected to drive the demand. Increasing usage to reduce weight and decrease carbon footprint is enhancing the automotive glass industry demand. Moreover, increasing automotive glass manufacturers support in optimizing the supply chain management.